♦ 2 rds x 'GREEN FEE' ONLY: 7100 baht/pax. ♦ RATES: Our discounted rates shown above are in Thai baht and are for 1 golfer. They are applicable until 31st March 2019 but are subject to change without notice. ♦ CARTS: Carts are available. Individual (700 / 1000 baht) They are not included in the rates shown above. ♦ COMPLIMENTARY: Laguna Golf Phuket are providing the following complimentary benefits. 1 x 500m bottle of water before each round. 3 x Titleist Velocity Balls with each rented set of golf clubs. Unlimited use of the practice facilities before play. 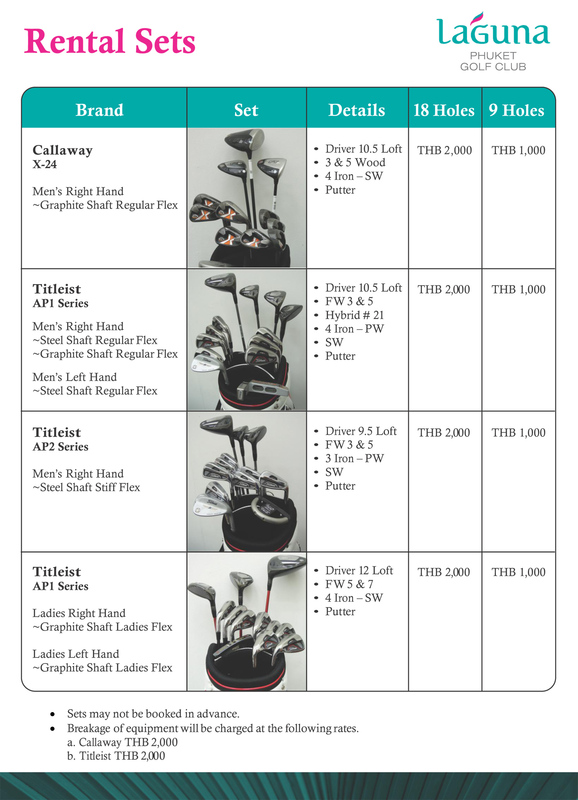 ♦ CADDY FEES: Caddies are compulsory at all of Phukets golf courses. Your caddy fee of 350 baht is included in your 'golf package'. If you have purchased a 'green fee only' you will need to pay the caddy fee direct to the golf club pro shop. ♦ CADDY TIPS: These gratuities are NOT included in your golf package! Laguna golf club recommends a caddy tip from 400 baht payable direct to the caddy after the game. ♦ SHUTTLE BUS: Complimentary shuttle buses operate from Laguna Beach Resort, Dusit Thani Laguna Phuket, Laguna Holiday Club Phuket Resort, Outrigger Resort, Angsana Laguna Phuket, Allamanda Laguna Phuket and the Banyan Tree Phuket to Laguna golf course. Followers (non-golfers) are permitted on the golf course, however they must be in a golf cart. Golfers who request a non-golfer to follow them during a golf game, must arrange for the follower to be in a golf cart by paying the shared golf cart fee. ♦ Followers must follow the clubs on-course dress regulations, the same as all golfers. 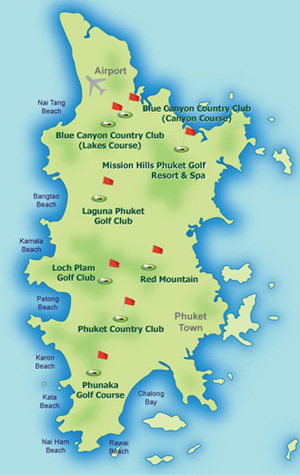 ♦ Laguna Golf Phuket allows 1 Follower per 1 Golfer. ♦ Followers may only drive the golf cart if they have already signed the disclaimer form in our Pro Shop. ♦ All flights (including those with a follower) are strictly expected to maintain pace of play. ♦ Laguna Golf Phuket will ask followers to leave the golf course, should they not fully comply with any of the above. ♦ To ensure fairness to other competitors, followers are not permitted during club competitions. This includes monthly medals and club championships. ♦Exceptions will be made only to golfers under 10 years old, who require parental supervision. ♦ RAIN CHECK POLICY: The following is a guideline as to how “Rain Checks” will be issued at Laguna..
♦ Once a player has started their round, under no circumstances will any refund be given. ♦ If a player plays less than 4 holes, a full 18 holes rain check will be given. ♦ If a player completes 9 holes, a rain check for the remaining 9 holes will be given. ♦ If a player completes 13 holes or more, no rain check will be issued. ♦ Any rental equipment rain check will be the same as the number of holes on the rain check. ♦ Rain checks are solely issued at the club management’s discretion. ♦ No rain check or refund will be given for the caddie fees. 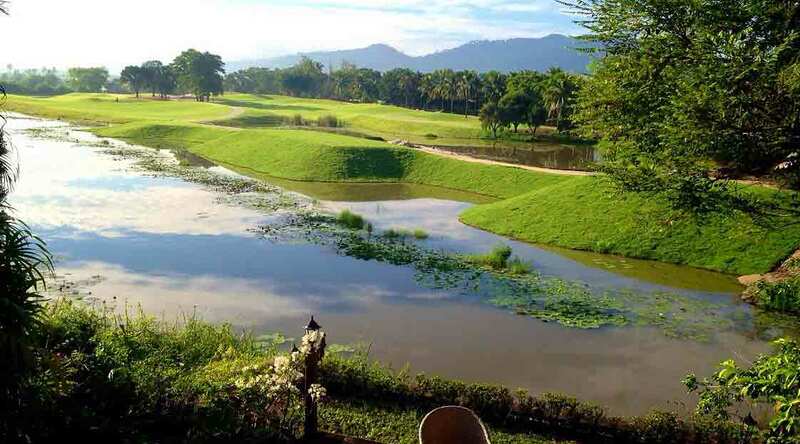 ♦♦Laguna Golf Phuket has long been known as one of the best golf courses in Phuket, but as of the 1st January 2015, the layout and facilities have been renovated and revamped to create a new and improved overall golf experience. Enjoying gentle breezes from the Andaman Ocean, this course is really enjoyable in every way and definitely not too demanding for the novice golfer. Basking in a location that enjoys much tropical abundance, this course epitomizes that special Phuket atmosphere. This course is relatively flat and surrounded by maturing trees that give many parts of the course a woodland feel , although you have to think your way around the layout, as each hole offers something new and unique. The course is 6,719 yards in length from the back-tees, with a par-71, culminating in a course that needs a wide range of shot options with lots of variety. You will encounter lots of undulations, although the conditions are generally excellent. The fairways have many tiers, depressions and mounds that dominate the play, and with wide fairways, this is a forgiving course with great scoring opportunities. The front 9-holes is where you will come into contact with many water hazards amidst the natural landscapes, with the back-9 weaving its way through mature trees. Be careful not to land in the rough because the mix of wood chips and native grasses can cause real havoc. Although there are not many bunker defenses, there are still enough located in prominent areas that could really catch you out. 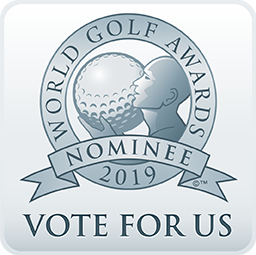 The onsite facilities include a large driving range, 2,500sqm putting greens, chipping areas and even practice bunkers. The clubhouse is home to a top notch restaurant and a fully-stocked bar so you can replenish. There is also an onsite spa and massage facilities, which are both ideal for finishing a round in proper fashion. The 17th hole is one of the trickiest finishing holes in Phuket. Set over a massive 612 yards from the back tees, you will have to play twice over water and it requires 3 very well-struck shots to reach the green. This is a difficult hole, so you have been warned. Distance from Patong: 17 Km.